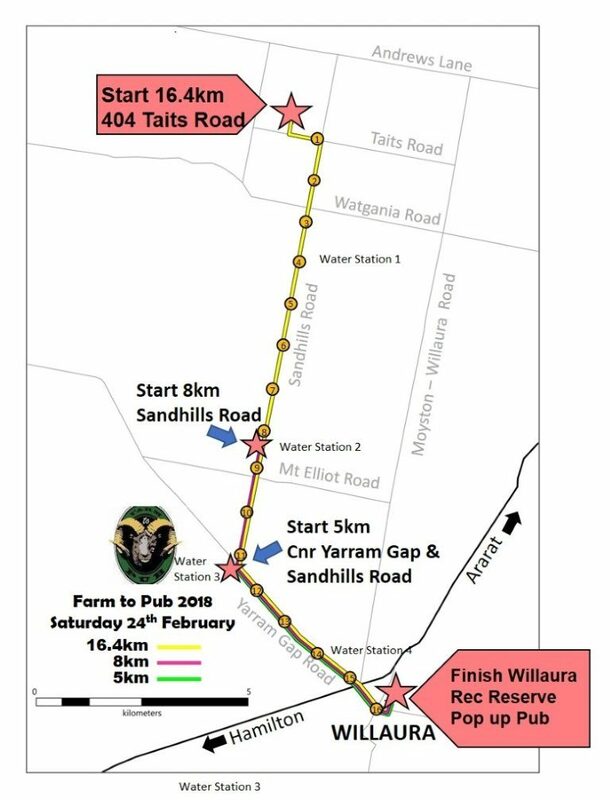 In 2018, the 15th anniversary of the Willaura Farm to Pub signals a return to the race’s legendary roots with the 16 km course setting off from Joyce’s Old Farm and sending runners down the fabled Sandy Lane. In addition to the 16km run, there are events for all ages and abilities – 16km ride, 8km run, 8km ride and 5km walk. Each of the 2018 Willaura Farm to Pub events are point to point events, finishing at the Willaura Recreation Reserve. The new home of the Willaura Farm to Pub, the Willaura Recreation Reserve, will have a “Pop Up Pub’, snacks and evening meals provided by Willaura Recreation Reserve Committee, a free jumping castle, live music and a working dog jump competition.